Roger looks for love, finds it. But will the CIA ruin it before Roger can? This is the last episode of American Dad! to air on Fox. New episodes resume on a different channel (TBS) on a different night (Monday) at a different time (9/8c) starting October 20. Okay, I'm normally a fan of American Dad's lack of Family Guy-style cutaways, but that prison-politics sequence had me crying with laughter. I love when a TV show makes me gasp with delight and that's just what happened when the picture shrank to letterbox to continue the saga of the golden turd. It's been years since that dangling thread has been pulled and I'm glad to see the writers hadn't forgotten about it. Everyone who encounters that cursed item comes to a bad end. It's cleverly done. I also got a kick out of Roger popping up in Stan's SUV without a costume during the opening theme song which immediately factored into the plot and aborted the sequence. Bookending things, I was sorry to see Stan put the "American Dad on Fox" book up on the shelf, but thankfully there's still more to come. Another Roger-one-joker to cap off the show's run on Fox seems just about right. However, I was pleased to see the Tale of the Golden Turd carried on. Coincidentally, if you're a fan and you've not watched the 2011 panel "An Evening with American Dad" from The Paley Center for Media, it's worth the hour. I was also super excited to see the return of the Golden Turd. With Corey Stoll in a role which seemed almost tailor made for him, given his performance as Peter Russo from the US version of House of Cards. A decent episode, but not great. 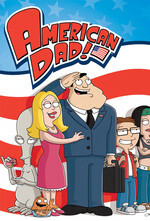 I feel like American Dad's best years are behind it now, much like Family Guy before it. Hopefully it finds its feet again on TBS.